This is an historical novel based around the true story of the New Lanark cotton mills which is now a UNESCO world heritage site. The story begins in 1788 in the early days of the mills and ends with Robert Owen’s entry into the story, as manager of the mills in 1800. The story is centred around the historic figure of David Dale and his family. Dale was a wealthy Glasgow business man who had plans for a new cotton mill and needed water-power to drive the machinery. He found the water and the power at the Falls of Clyde, close to the town of Lanark in 1784 and decided to build a mill village at the foot of the Falls: New Lanark. Dale was a pioneer of his time in that he believed that workers’ conditions should not be brutish and although by our standards they were staggeringly harsh, he was responsible for showing that business could be done differently and still be profitable. The story is told engagingly and the true events of the time have been intertwined with the lives of the Scott family who live and work in the mill village. The story contrasts the life of the Dales’, one of prosperity and comfort with that of the Scotts’ which is about unrelenting hard work and basic living conditions. However it also demonstrates that even the rich were not immune to the deadly diseases that stalked the time. The book is set in the context of the French Revolution and the rise of Napoleon with all the impact that has economically and socially. Robert Burns and other historical figures hover in the background. The story engages you from the beginning through the strong characterisation. Very quickly you care about the young people who are ravaged by the difficulties of living in these times. You are aware that tragedy is never far away and you are constantly hoping for the best for the characters. The descriptions of New Lanark itself brings the place alive in your mind and I enjoyed the author’s descriptions of the countryside and the Falls; you sensed a real affinity with nature in those descriptions. 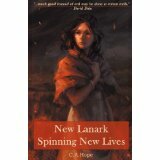 A second book is to follow; New Lanark Living with a Visionary which picks up from David Dale’s sale of the mill. Robert Owen takes over the mill after marrying Dale’s daughter. I was left wondering about the Scott family too. The older brother Sam was spoken of in the book but we never met him. Will he form part of the story in the second book and will Sarah return?